Last week in my CSA box I got 3 stalks of rhubarb and I used two in the Strawberry Rhubarb bars I post on Saturday, but I had one left and I thought what I could possibly do with 1 stalk of rhubarb? I didn’t want it to got to waste it and then I thought, Smoothie Monday! 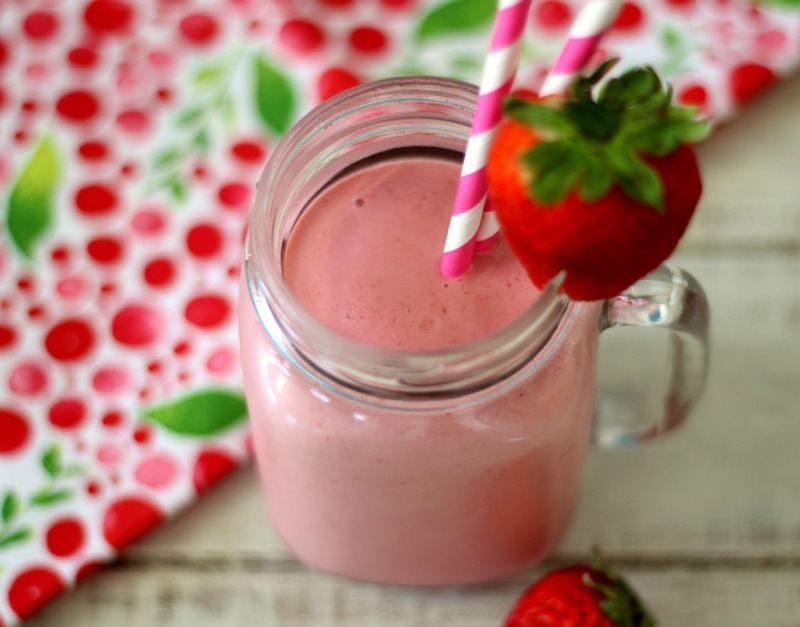 Yah, so I decided to make a Strawberry Rhubarb Smoothie! This was the perfect idea! 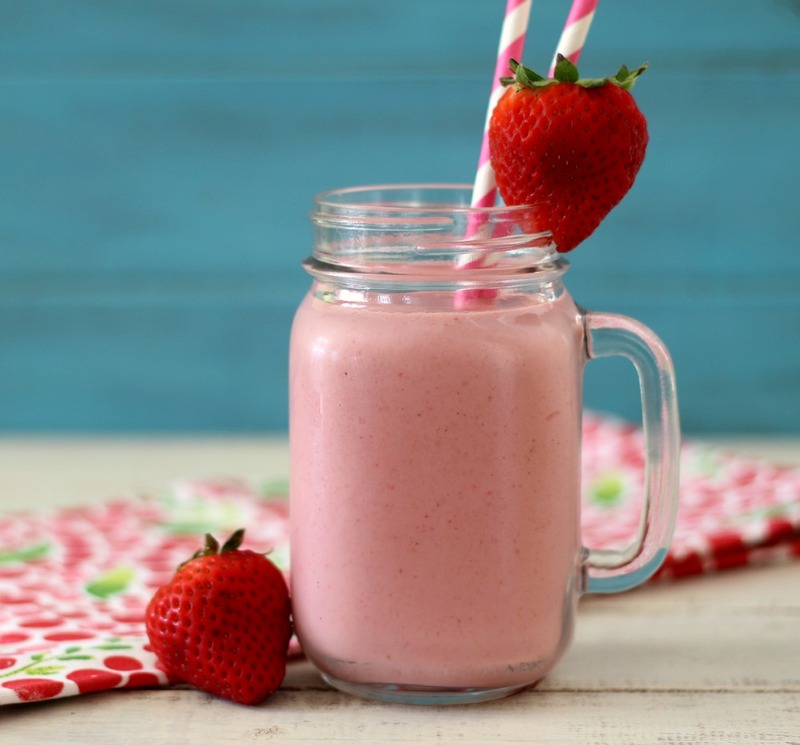 The smoothie is creamy, smooth, perfect amount of strawberries with a pinch of tang from the rhubarb and to sweetened it up I used a little bit of honey and vanilla greek yogurt. 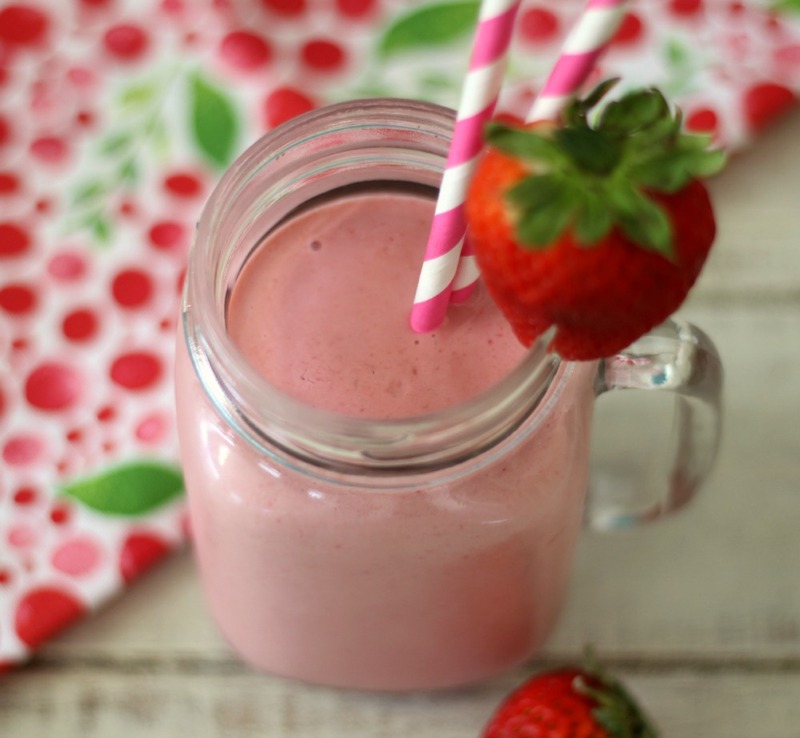 The smoothie exceeded my expectations and now I need more rhubarb because I need to make this again!! Have you ever had rhubarb? It’s quite interesting if you ask me. It’s kind of sour, but yet mixed in with other fruit, it tastes really good, plus it’s loaded with vitamins and fiber. I can see why there are so many rhubarb recipes out there. I’m going to have to expand my horizon and try it out in other recipes. This past week was the first time I ever tried rhubarb. Did you use raw rhubarb for this? I have tons of it in the garden and am trying to come up with new ways to serve it. I have not baked with rhubarb and certainly never thought to add it to a smoothie. Yet, this looks wonderful. Time for a change! 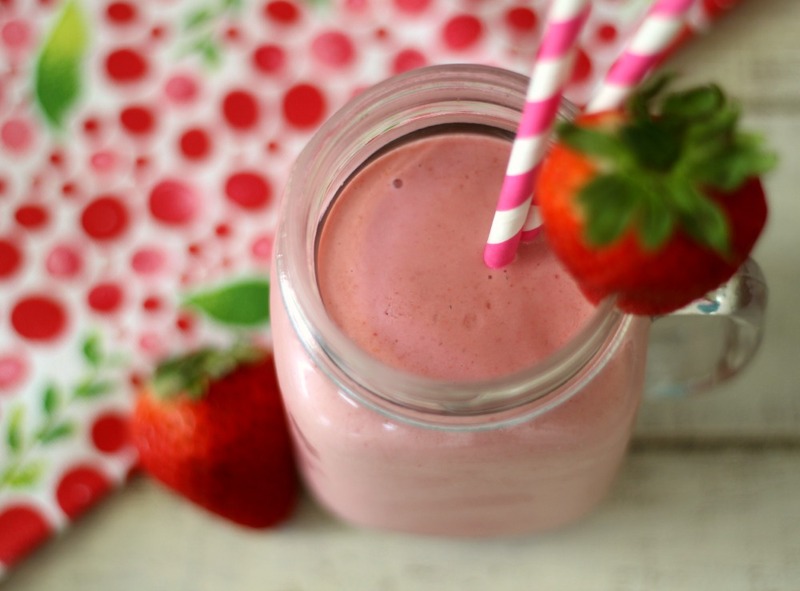 I love it in a smoothie, but it can be tart, so the honey tones it down. You have captured my heart with this smoothie! It is incredible!! I’ve been following your blog for about 2 years now and I’ve made quite a few of your recipes. My favorite is your three cheese chicken alfredo—so much better than Olive Garden!!! I have a part request and part favor to ask of you. I’ve made several of your smoothies as well and they taste great. However, I’m having jaw surgery later this week (Thursday). I’ll actually be having two surgeries, back to back, on the same day, and it’ll take anywhere from 3-5 hours to complete. I was hoping and wondering if you could make me a smoothie recipe that meets the criteria that I’m allowed to drink? I can’t have diary (I get congested) and so I bought Vanilla Silk Almond Milk. I also stocked up on lots of berries (strawberries, blueberries, blackberries, and raspberries) as well as quite a bit of other fruit to puree. If you could, please, create a smoothie that I’m allowed to drink I would seriously appreciate it. I’m not very good at getting creative myself and therefore follow your smoothie ‘recipes’ for instructions. Again, I would very much appreciate it if you did this. 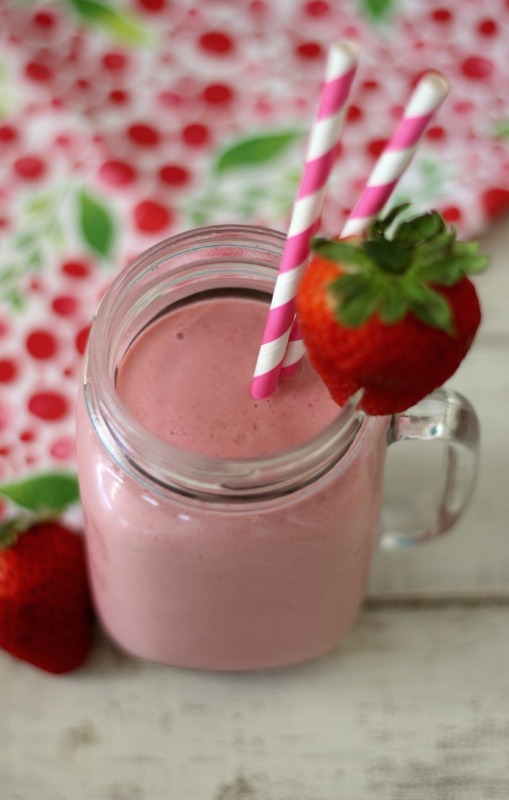 Great idea to make Strawberry Rhubarb Smoothie and sweetened with a pinch of honey. Smoothies like this make my mornings brighter. Love this recipe! Thank you so much Rachael. I loved the honey in this smoothie, it adds the right balance of sweetness without going overboard.